Exam period is a particularly stressful time. Consider these tips so you can take a positive approach to doing well and demonstrating your learning. Exercise. Take some time from your exam preparation to move and be active. Some experts recommend concentrating on your material for approximately 50 minutes, then taking a ten minute break to walk and give your attention a rest. Relax. Maybe you relax my meditating, deep breathing, petting your dog, drawing or getting lost in a good song. Take time each day to this kind of true relaxation. Eat well. Feed your brain with high quality foods that give you energy to do your best. Notice foods that make you feel drowsy or sluggish and avoid those. Recognize your achievements. Remind yourself of your successes over the term, including things you’ve learned and skills you’ve developed. Keeping this positive mindset will help you remain focused. Sleep. It’s tempting to stay up all night, cramming, but sleep allows your memories to consolidate and better prepares you for your exam. Sometimes, you may even dream about the material, which is pretty neat. Reward yourself. If you stick to your study schedule and get some good work done, reward yourself with something that will boost your mood and motivation. Choose your rewards wisely to ensure they don’t derail your schedule and budget! Plan time away. Schedule your breaks to you can enjoy them guilt free, knowing that they are part of your plan. Work hard and rest. Work hard again and rest again. Repeat as needed, keeping that positive cycle going. These strategies will help you stay on-track and perform your best on upcoming exams. Good luck! 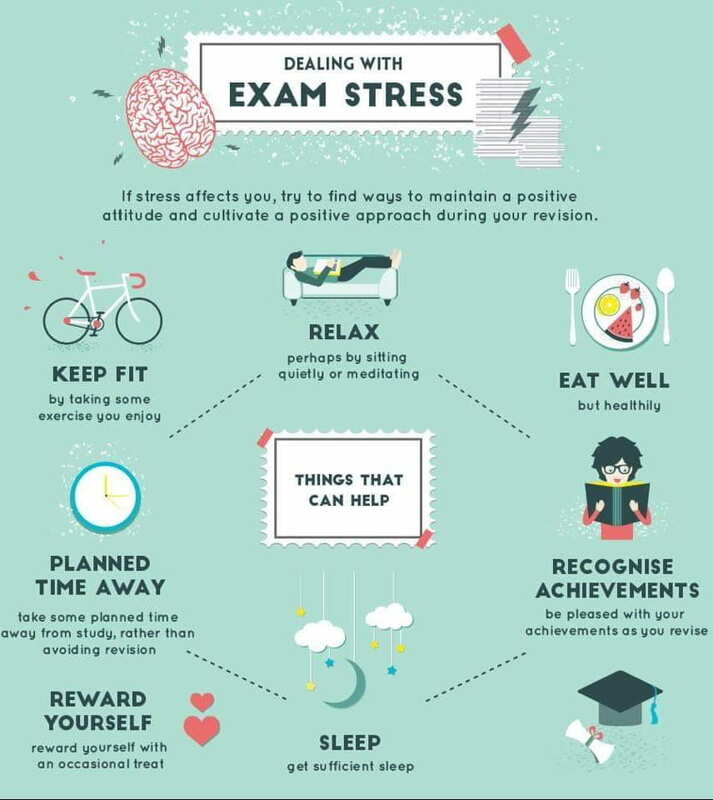 The end of term can be a very stressful period, with students experiencing added pressure to complete projects and perform well on exams. Taking a break to relax can help students cope with this stress so we’re welcoming the St. John Ambulance Therapy Dog Program to campus. Students will be encouraged to sit with, feel, touch and pet a trained dog, enjoying the relaxing effect this can have on their mind, body, and emotions. 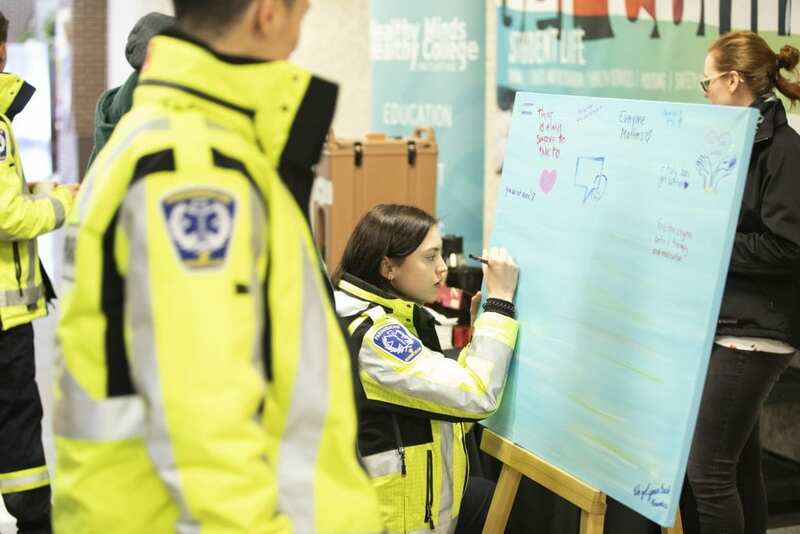 According to St. John Ambulance, the nation-wide program boasts 3,354 volunteer teams who assisted more than 120,000 clients throughout 2015. Therapy dog teams visit hospitals, retirement residences, care facilities, schools and universities. 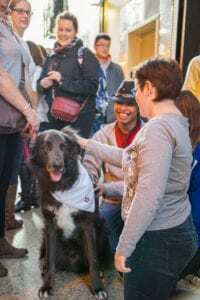 Therapy dogs have been on campus in the past, and many students have genuinely enjoyed the visits. 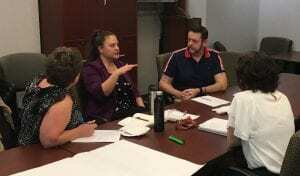 On A pril 16 we hosted the first of two dialogues to help the Mental Health Commission of Canada develop a National Post-Secondary Mental Health Standard. Students and Employees shared their thoughts about what works well to support student mental health and what institutions can do better. All of our ideas will be forwarded to the technical committee who writes the Standard. 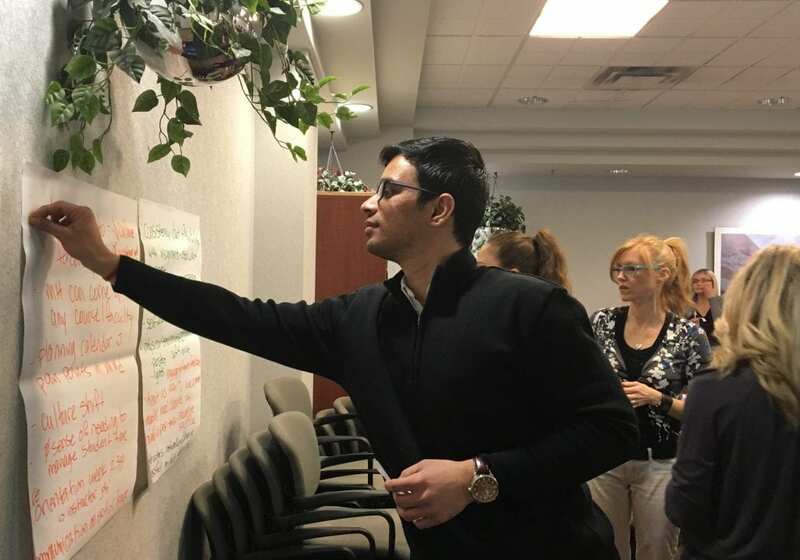 The standard will a ct as a voluntary process guideline to help Canada’s academic institutions promote and support students’ psychological health and safety, and support students’ success. Do you want to have your say? 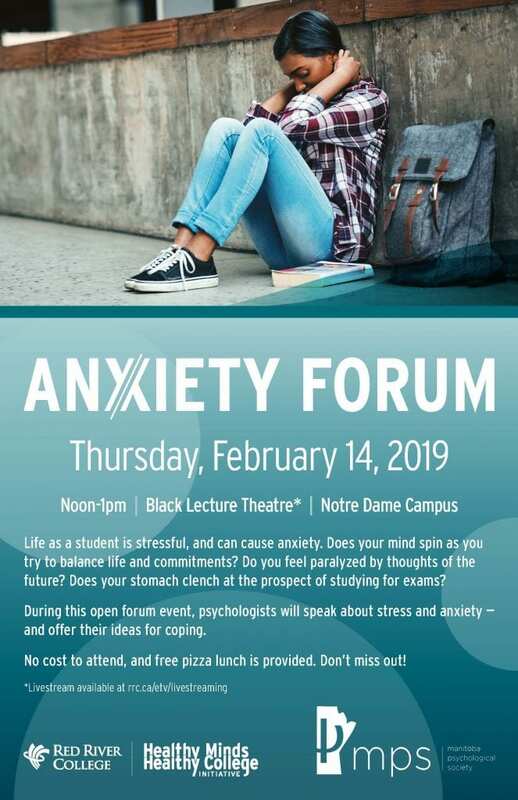 A second dialogue will be held Thursday the 18th from 2-4pm in room A137 of the Notre Dame Campus. Contact Breanna for more information and to register. 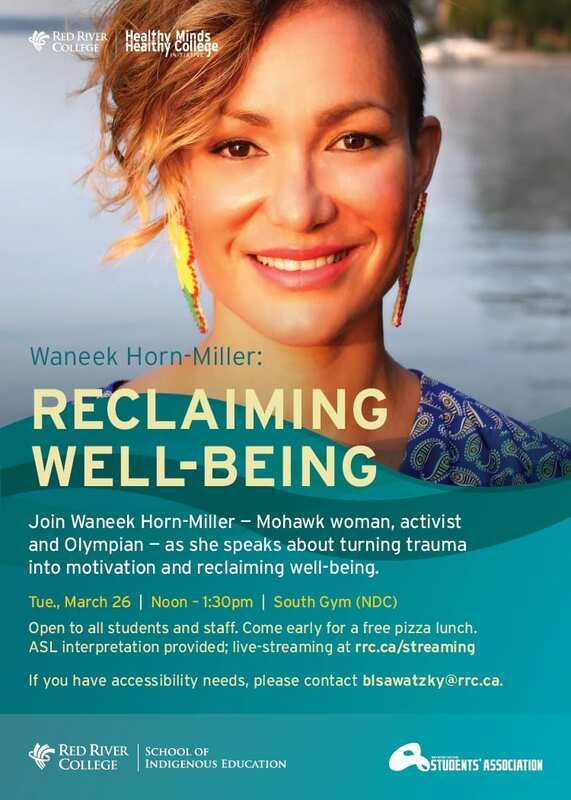 On Tuesday, March 26 RRC welcomed Waneek Horn Miller – Mohawk woman, activist, and Olympian – to speak about turning trauma into motivation and reclaiming well-being. Waneek captivated the audience with stories of her strong mother, embracing her identity, introduction to sport, and resilience in the face of obstacles. She shared lessons learned on her path to becoming captain of the Canadian Olympic water polo team and finding her sense of inner strength. Her t alk was fantastic and is a “must watch” for all students, staff and faculty members interested in resilience, well-being, and truth and reconciliation. Thanks to the folks at eTV, the recording of her presentation can be found here. Read more about Waneek here. You’re invited to attend a lunch and talk featuring Waneek Horn-Miller – Mohawk woman, activist, and Olympian. She’ll be speaking about turning trauma into motivation and reclaiming well-being. All students, staff and faculty are invited to attend. Come early for a free pizza lunch. If you have accessibility needs, please contact Breanna. ASL interpretation will be provided. If you can’t make it in person, catch the livestream at rrc.ca/streaming. Throughout her life, Waneek Horn-Miller has always stood up for what was right—as a mother, an activist, an athlete, and an entrepreneur. This has entailed hard choices, pain, and sacrifice. But this commitment has also made her one of Canada’s most inspiring figures. Horn-Miller’s public life began in 1990 at the age of 14. During the Oka Crisis, she protested the planned development of condos and a golf course on traditional Kanien’kehá:ka (Mohawk) lands and burial grounds near Montreal. After nearly 80 days of stand-off with the RCMP and armed forces, she was stabbed in the chest by a Canadian soldier wielding a bayonet. One of Horn-Miller’s greatest achievements has been in athletics. “Sport in the Native world is more than just something to be physically active,” she says. “It’s a suicide preventer. It’s a self-esteem creator. It’s a leadership developer.” She was the first woman to be named Carleton University’s Athlete of the Year, which she won four years in a row. 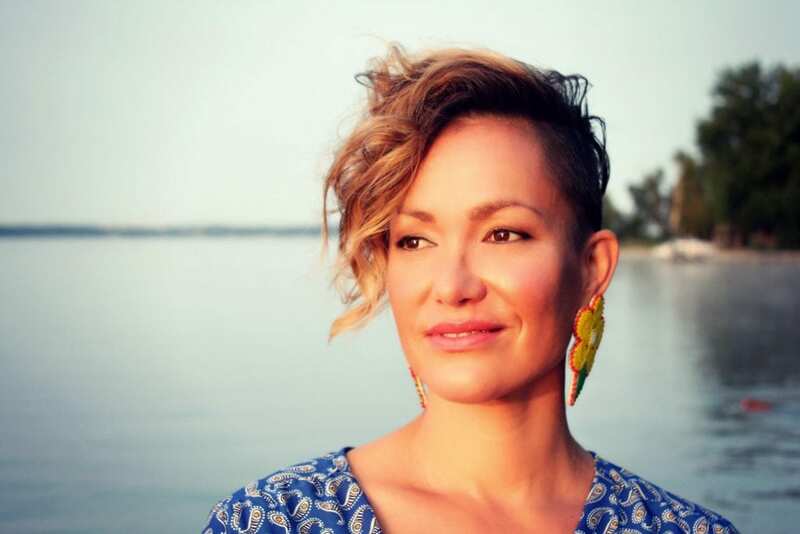 After winning gold with her water polo team at the Pan Am Games in 1999, she became the first Mohawk woman from this country to ever compete in the Olympic games, co-captaining Team Canada in Sydney in 2000. That same year, she appeared on the cover of TIME magazine. 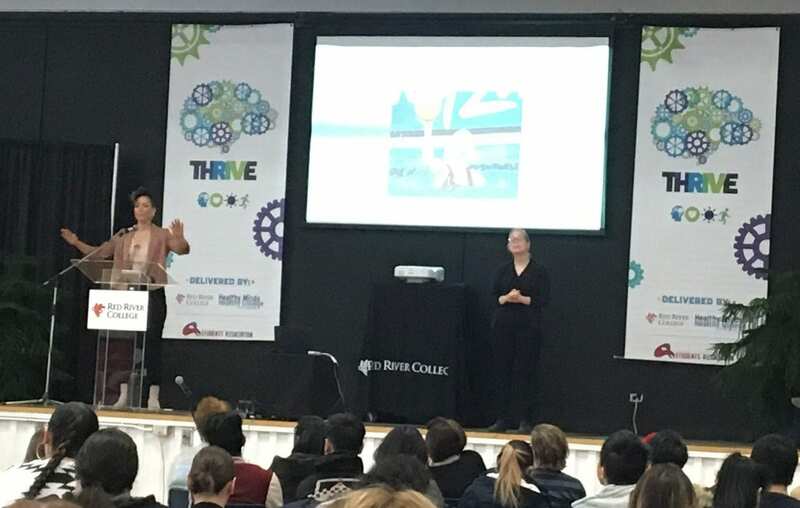 As one of Canada’s few Aboriginal Olympians, Waneek has used her passion and experiences in sport to influence Aboriginal and non-aboriginal leadership towards making Sport and Wellness a community building priority. 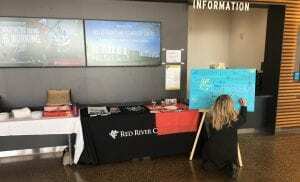 RRC’s Healthy Minds Healthy College Initiative, along with the Students’ Association and School of Indigenous Education are so pleased to welcome Waneek. If you could take a pill that would decrease your stress and anxiety while improving your focus and performance, with no side effects, would you take it? Mindfulness can deliver these results. Mindfulness has moved from the realm of the obscure to now what is seemingly obvious, becoming the go-to mental fitness approach for enhancing individuals, teams, leaders and organizations. Learn what mindfulness is, the science behind it, and the practical application in your daily professional and personal life. You’ll also be given an orientation and opportunity to register for the Mindfulness Challenge, an evidence-based online training in mindfulness. Lunch will be provided and the session will be delivered as a webinar. This event is accessed by registration only. Seating maximum is 26. To register, please click here. Geoff Soloway has been creating and researching innovative trainings in the area of mindfulness and wellbeing for almost 20 years. He is currently Founder and Chief Training Director of MindWell U, offering bilingual online and in-person evidence-based mindfulness trainings in the workplace. 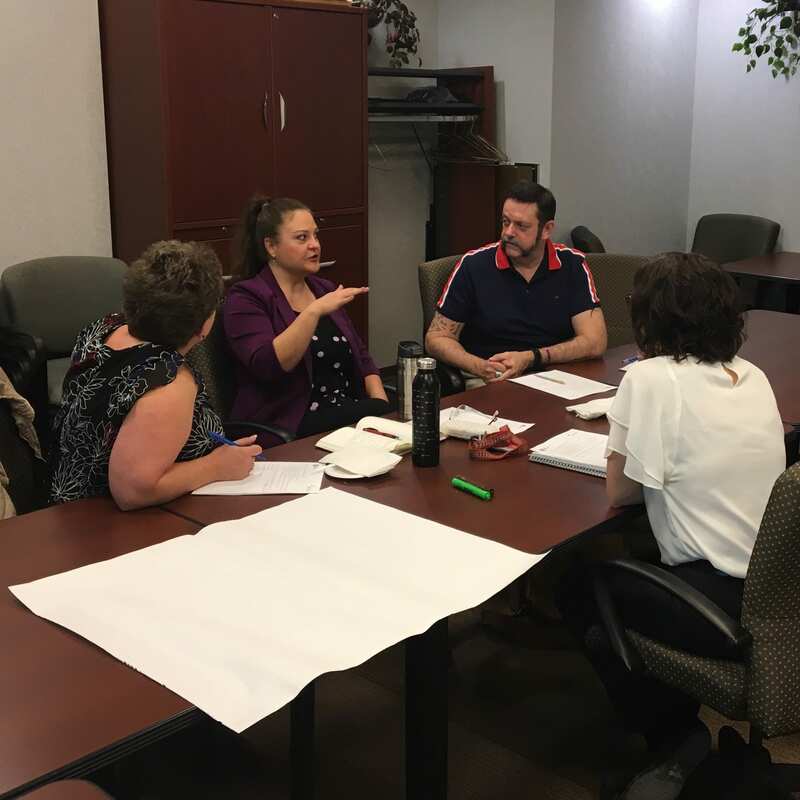 Geoff has worked as an Instructor at University of Toronto, University of British Columbia and the University of Fraser Valley, and as a consultant in the area of mindfulness for diverse organizations such as WestJet, Coca-Cola, Loblaw, and the Privy Council Office. 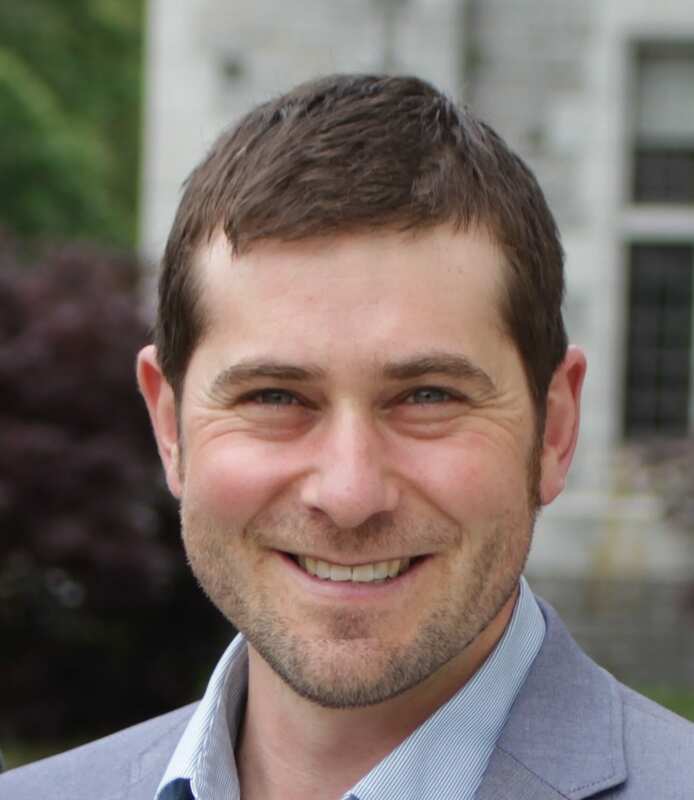 Geoff completed a PhD and Master’s of Education in the area of Mindfulness from the University of Toronto as well as a certificate in Organizational Coaching from the University of British Columbia. 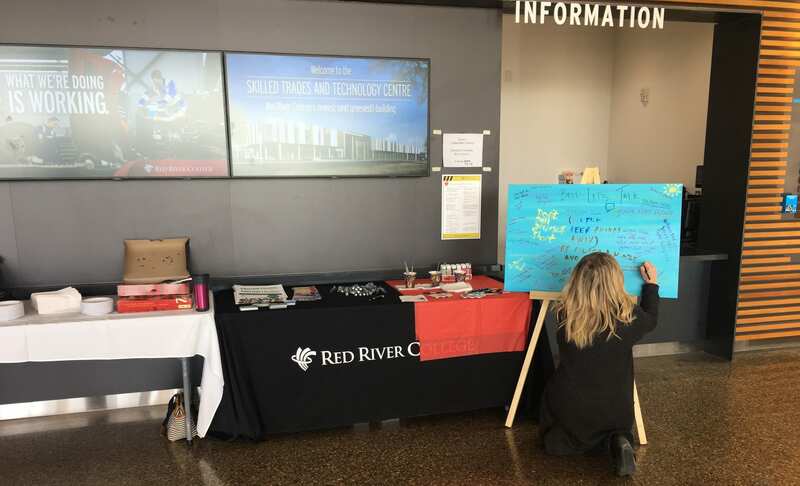 Kindly advise to Taryn Presley at tpresley@rrc.ca or (204) 632-2484 if you if you have any barriers to accessibility or any dietary restrictions for the lunch no later than Monday, March 4, 2019. 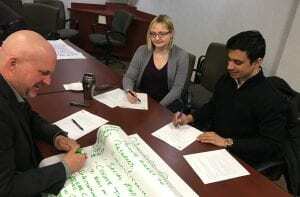 Stay tuned – a 2nd mindfulness webinar and lunch will be taking place on March 12 – watch for this in Staff News! 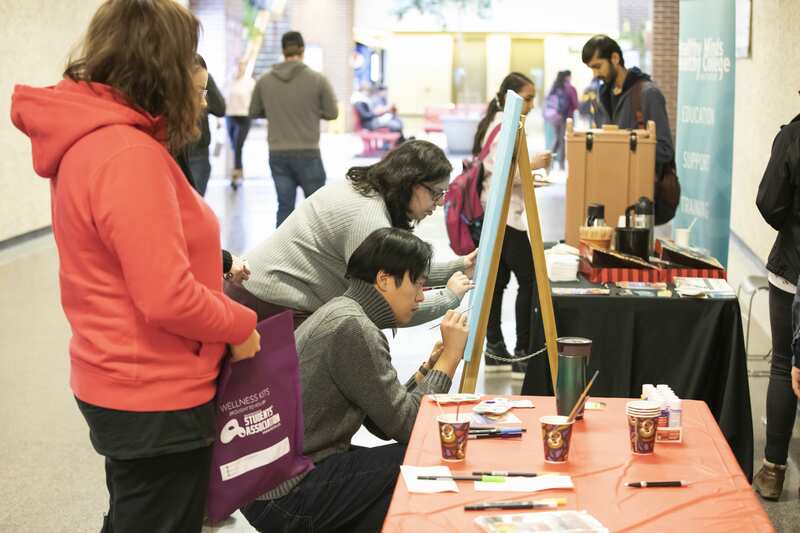 On January 30th, RRC joined others across the country in observing Bell Let’s Talk Day – a campaign dedicated to moving mental health forward in Canada. 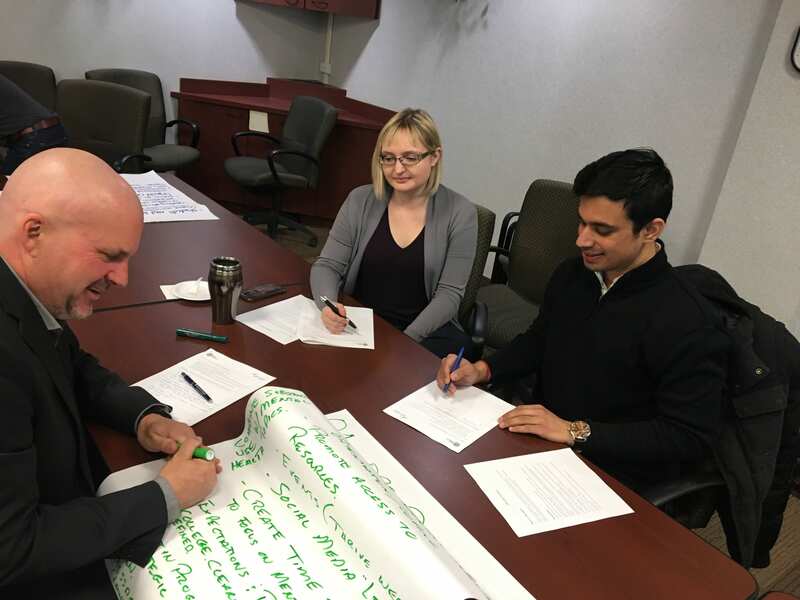 The strategy is built on four pillars: anti-stigma, improving access to care, supporting world-class research, and leading by example in workplace mental health. At nine different campus locations, staff and student volunteers served free refreshments, distributed printed mental health resources and invited folks to contribute to a giant art canvas. 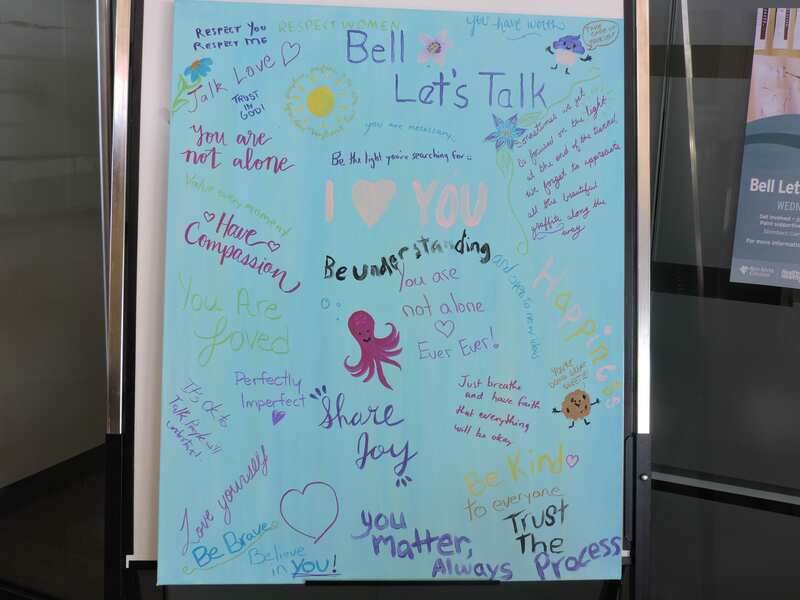 On the canvas, people shared words of encouragement or supportive images to encourage someone who may be struggling with mental health difficulties. We know that each year 1 in 5 Canadians will experience a mental health problem. While over the course of our entire lifespan, nearly half of us will. 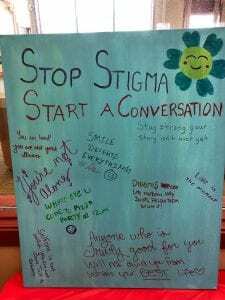 Unfortunately, despite this prevalence, judgmental and prejudiced attitudes about mental illness abound, causing many to struggle in silence, feeling shame, embarrassment, or guilt that compounds their distress. 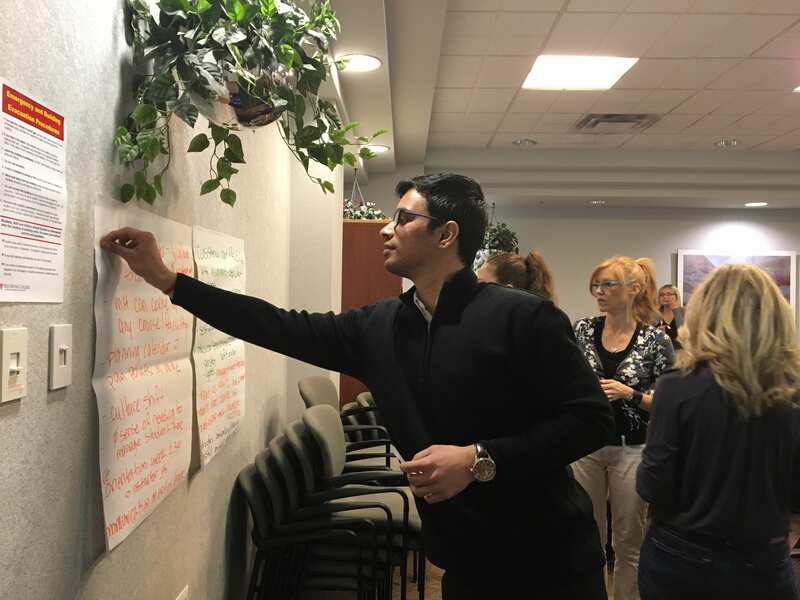 We envision a community where mental health problems are accepted as a part of the human experience; where people can speak openly about these, receiving appropriate health care and community support. 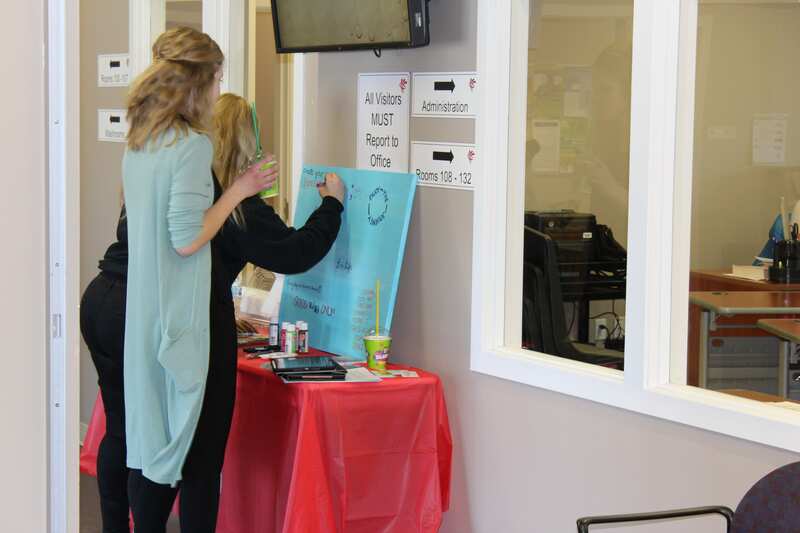 In addition to the Bell Let’s Talk Day activities, the RRCSA participated in the Students Let’s Act campaign – a national advocacy effort, lobbying the Federal Government to devote more resources to post-secondary student mental health supports. 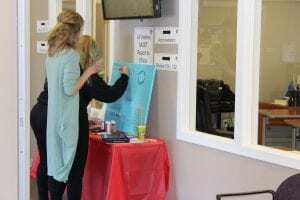 RRC’s Recreation Services is hosting this year’s Get Movin’ Challenge. Those who are involved are trying to log 7,000 steps per day, through a variety of activities. Sign up to join the fun. The prizes are fantastic this year! Since physical activity contributes to a healthy mind, we’re supporting the Challenge with three group walks outdoors at the Notre Dame Campus. These walks are a perfect opportunity to connect with friends or colleagues, meet new people, get fresh air and sunshine, while logging 3000 steps. Walks will start at 12:15 outside the Campus Store (NDC) and will return to the same place by 12:50. Bring your warm gear; walks will go ahead unless the Environment Canada website indicates a temperature of -27 C or lower with the wind chill factor. All students, staff and faculty are welcome to join; there is no need to register.